Attention web spammers! You now have yet another venue to muck up the SERPs….congratulations! I just read about Google’s new knol project and although I’m sure it will be hugely successful, I can’t help but think that this is bad news. Why? Simple. There will almost certainly be one less organic position available on Google’s first page of results for most keywords. And eventually all keywords, I have to assume, based on what I just read. I’m sure Geico (who is listed at #9) is thrilled! 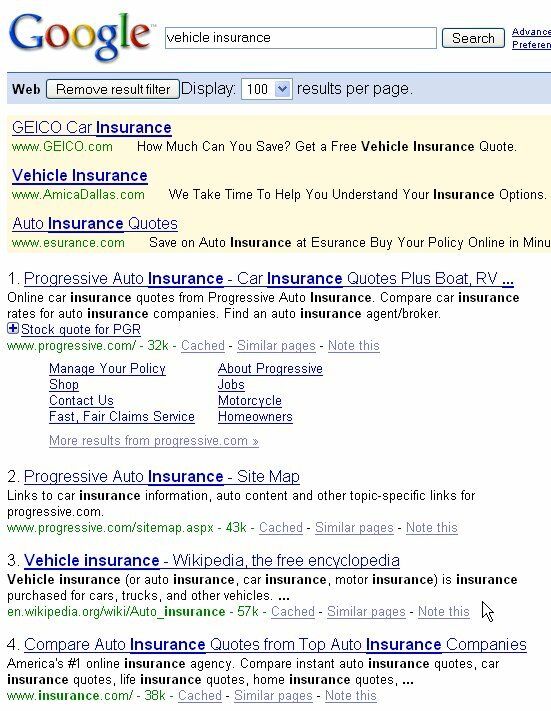 I mean, if I’m searching for vehicle insurance I’m probably looking to purchase it, which I obviously can’t do at Wikipedia. But this isn’t about that….really. My real concern is that Google plans to stay far, far away from editing these “knols” yet they ARE going to let the authors monetize them and share the ad revenue that Google generates. Wow. I can see it already…a whole bunch of new crap occupying the SERPs. Think about it. Anyone remember when AdSense came out? All the “MFA” sites that were built (that Google still hasn’t fully gained control of, I might add) that just seemed to flood the web. I think this will be the same deal. “Authors” will write on every imaginable topic and, whether it’s accurate or not….good or bad, Google will almost certainly rank these pages higher than they should. If you don’t believe me, please see the screenshot above! In Google’s defense, they do a lot of things right and I’m sure this will be a nice “product” for them. BUT, I cringe at the thought of them creating such an easy-access platform for generating SPAM. Maybe I’m wrong, but I would like to hear Matt Cutts’ perspective on this. They’re slaughtering publishers of text link ads for selling links because they affect rankings. But won’t this negatively affect rankings, too? Will Google automatically include knols on the first page just as they do Wikipedia….simply because they’re knols? We’ll find out soon enough, I guess. Previous PostPrevious CONTEST WINNERS ANNOUNCED!